The earth is taken from by-pass Conveyor. As request connected to main conveyor. As request taken only one size. 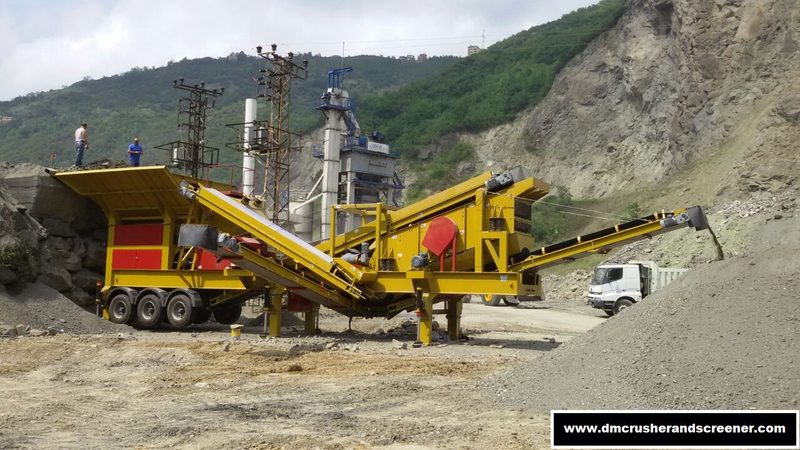 DM 10 – Mobile Closed Circuit Crusher and Screening Plant – New Technology Limestone , River Stone , Mining Crusher . DM 10 – Closed circuit crushing system is all collected in one single platform and can be transported with a truck. The R-D group has designed this series for short term installation . This crushers can easily do the work of classical plants . DM Series refers to a crushing /screening closed-circuit plant on one chassis. Offers unsurpassed production of cubical spec products for small, medium, or large jobs. Produces multiple, cubical spec products with three-deck inclined screen. Returns material retained on the top deck to the impactor for further processing. This machines are the most prefered in Turkish market and the World market . It is equipped with 3 axle, air-operated brake system and signaling system. Special heavy duty construction chassis. There are 6 hydraulic feet mechanisms in the hydraulic system. These feet are strengthened by the fixed feet after they are locked. The material is Siemens branded. The panel system has a remote control system that operates with radio control frequency. DM Machine contains a system that can remove our panel systems from the main scale by about 8 metres.